There’s been an interesting discussion going on in the online sewing community regarding doing muslins for sewing projects. For the those who don’t know, a muslin is a test drive of a pattern using an inexpensive fabric, typically muslin. The muslin isn’t sewn to completion. It’s sewn just enough to see what, if any, adjustments need to be made to the pattern so it fits better or is more flattering. I initially read about the “muslin backlash” a few days ago in a post at Gertie’s New Blog for Better Sewing. 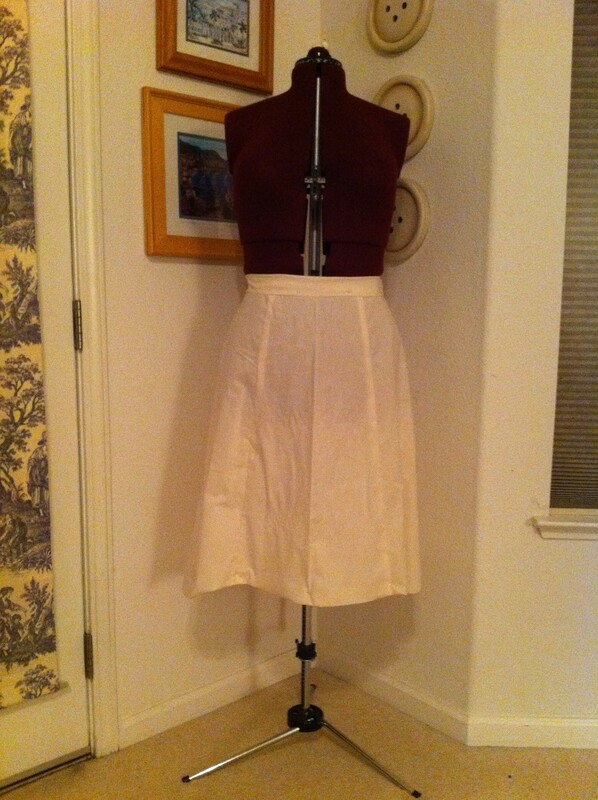 So, tonight I was starting my next project, when I thought, “Do I really want to make a muslin for this relatively simple skirt?” And my answer was a definite “Yes,” and here’s why. Instead, I started analyzing the muslin, figuring out what needed to be fixed, and altering the pattern accordingly. When I sewed the pattern up in the fashion fabric, it was a total success. Now when I was a tall, underweight teenager (30 years ago! ), all I needed to adjust was length and shoulder width. Today, my figure is far more complicated to fit. The bustline came in with the first pregnancy, and what little waist I had on my straight figure went away. Between a full bust adjustment, lowering the bust point and checking how the neckline falls, I’m too scared NOT to do a muslin. The neckline could be too low, the waistband too loose, the darts too deep, the hemline unflattering. I’ve often been surprised at the areas that need adjustment. When you consider that the pattern image is often a drawing, it’s a wonder the garments ever look like we expect. I want to be confident of what my end result will be. Now, to be fair, some of the “backlash” regarding muslins has been about the waste of fabric and the waste of time when making a quick and easy garment. For me, I’d rather waste the cheap muslin than take the chance of wasting a more expensive fabric, and I sew because I want better fit and quality than ready-to-wear usually provides. Sewing is all about the opportunity for each of us to have complete creative control over the finished product and how we chose to make it. Making a muslin is my choice. If it’s not yours, I completely understand.